of random reads, as would be produced by a next-gen sequencing run. -r reference genome, in fasta format. -R Only for metagenome projects. Directory containing references. -a Only for metagenome projects. Species-abundance file. -n number of reads to produce. For paired end reads, number of pairs. -g haplotype file, specifying location and frequency of snps. -G directory of haplotype files (metagenomics mode only). -l length of reads. Integer value, or -l d for empirical distribution. -m error model file *_single.gzip or *_paired.gzip. -c use this flag if you wish to draw reads from a circular genome. -q quality score offset. Usually 33 or 64 (see manual). -o output file name prefix. -u Mean fragment length for paired end reads. -u d for empirical. -s standard deviation for fragment length. Use only with -u and -p.
-p use only to create paired end reads. -r read length. Set to LONGEST read in dataset. -s input file in sam format. -n desired output filename prefix. -c specifies reference genome is circular. Otherwise assumed linear. -i use only every ith read for model (optional, must be odd). -m maximum indel size (optional, default=4). -p use only if your data contains paired end reads. -r eference genome, in fasta format. 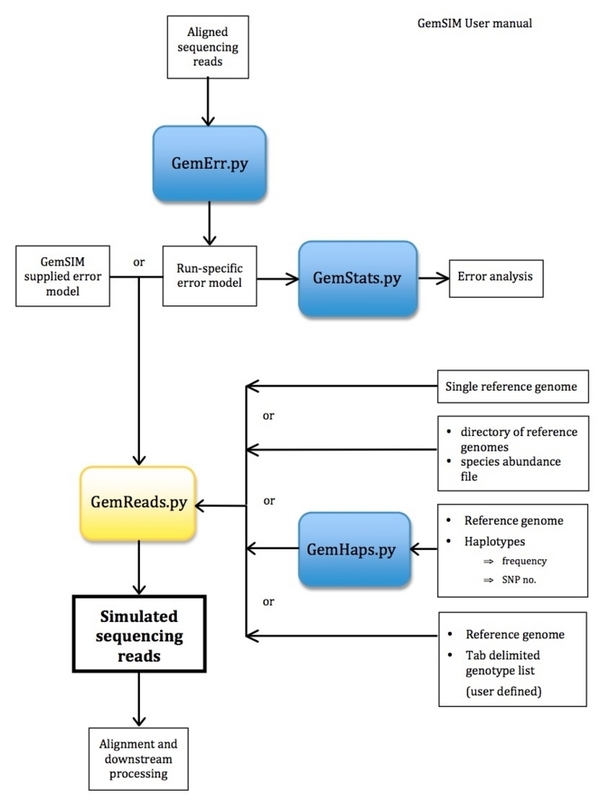 GemSIM: general, error-model based simulator of next-generation sequencing data. McElroy KE1, Luciani F, Thomas T.
BMC Genomics. 2012 Feb 15;13:74.